As your business’s ecommerce marketing starts anew in 2017, focus on a measurable strategy that will help you succeed. For many ecommerce marketers, the promotional year doesn’t really start with the calendar. Rather January is when you recover from the frantic holiday selling season and, perhaps, focus your attention on customer service, managing exchanges and returns, and “right-sizing” your inventory. Thus your marketing efforts could really start in February. This ecommerce marketing checklist is meant to help you think through your marketing plan for this 2017. Recently, I gave a presentation to a group of managers and directors at a brick-and-click retail chain. The group was interesting because of the broad range of attendees. There were folks who managed physical stores, still carried a flip phone, and generally thought ecommerce was dangerous. There were also folks there who manage the company’s online business and think they are the store’s best hope for continued success. During my presentation, one of the store managers asked me why I was recommending a particular new marketing tactic. I told him, in jest, that I was guessing. A colleague clarified what I meant: “Guessing” for me was really strategic experimentation based on a lot of data collected over a few years. “What you can measure, you can improve,” this colleague said. 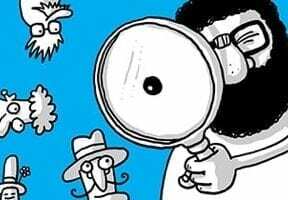 The point was that while I did not know with absolute certainty that a particular marketing tactic would work, I was confident because I had measured similar tactics and knew how those had performed. And, even if it failed in some way, I would still learn something from it because I had a detailed method for measuring it. So, measure how you market. Try to have a few points of measurement for every marketing tactic and take the time to analyze those measurements with an eye toward improving. For your marketing measurements to be effective in 2017, first know what you’re trying to accomplish. In 2017, is your ecommerce business focused on acquiring new customers, generating revenue, making a profit, or something else? And what do you mean by “acquiring new customers”? Is that two new customers or 200,000? Your marketing strategy should help you make choices about how, when, and where to market. For example, if your marketing strategy is to increase profit, and you have determined that repeat shoppers are seven times more profitable than new customers, you might want to focus your marketing on existing customers. In this case, it would not make much sense to spend a lot of money on pay-per-click advertising or search engine optimization since those disciplines focus on getting new customers. You might market to new prospects, but your main activities would be elsewhere because of what you’re trying to accomplish. For one of the businesses I help market, 2017’s strategy was to increase profit 5 percent, whilst boosting return on advertising spend and increasing the amount of co-op funding received. Knowing this helped guide our marketing choices. Smart Insights, a consulting firm, surveyed more than 2,300 marketers, asking them which marketing tactics they believed would have “the biggest incremental uplift in leads and sales in 2017.” About one in five surveyed said content marketing. It is worth mentioning that the Smart Insights survey includes business-to-business marketers, which might impact the weight of the results relative to ecommerce. Nonetheless, content marketing may be one of the best or even the best long-term marketing tactic when it comes to acquiring, engaging, and retaining customers. 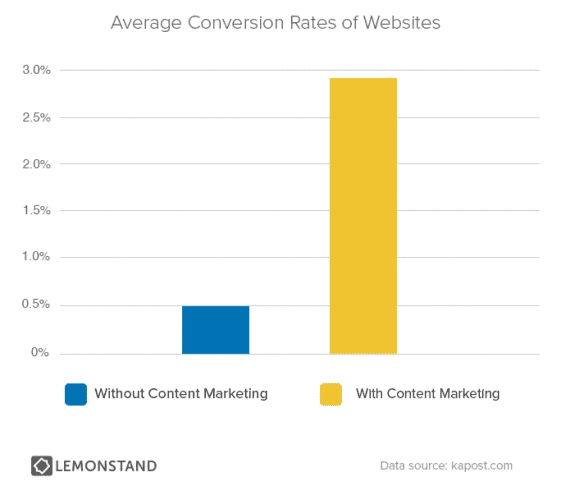 Content marketing can increase ecommerce conversion rates. Your 2017 ecommerce marketing plan should probably include content marketing. In September 2016, research firm Vanson Bourne conducted a detailed survey on behalf of Brightcove, the video platform. The survey queried about 5,500 viewers (18 years and older) of “social video” from five countries — United States, United Kingdom, France, Germany, and Australia. On average, the viewers surveyed watched about six hours of videos on services like YouTube, Facebook, Snapchat, and Twitter. What’s more, about two-thirds of respondents said they have increased the amount of video they watched on these services in the past year. Americans watched the most social video, spending about an hour a day, and some 85 percent of the Americans surveyed said that they interacted with brands on social media. A June 2016 comScore and YouTube study reported that about 35 percent of millennials surveyed would rather watch YouTube than traditional television, while about 18 percent of that same group preferred traditional TV. As you plan your content marketing for 2017, include videos and publish those videos on YouTube. Mobile friendly, responsive, accessible, and high performing is what your ecommerce website needs to be. Part of ecommerce marketing is having a functional ecommerce website that meets customer expectations. In 2017, those expectations are pretty high. A majority of site visitors will be using a mobile device, so mobile optimization is essential. You will need to ensure your site is accessible to handicapped consumers, and no shopper is going to wait long for your site to load. This item is a reminder on the checklist that your ecommerce website has to be right. Email marketing remains one of the most effective ways to drive ecommerce sales. There are very few marketing activities that work as well or as quickly as email. Campaign Monitor, an email service provider, reported that for every dollar invested in email marketing, your business might expect an average return on investment of about $38, making email one of the best marketing investments. 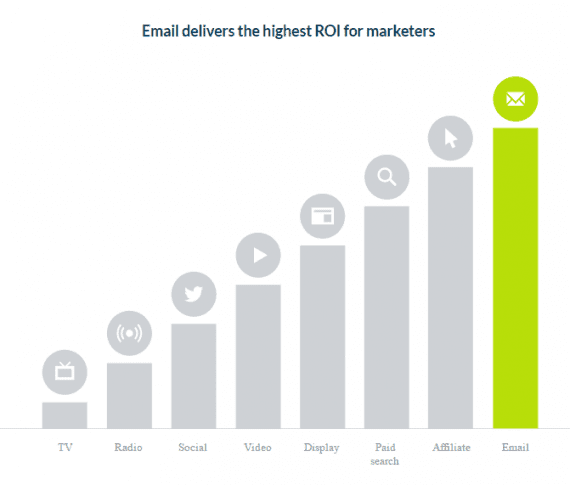 Campaign Monitor says email marketing has the best return on investment of leading digital marketing tactics. With this in mind, spend time building your email list. One of my favorites is to run online contests. As part of the contest terms, when folks enter they are subscribing to email marketing messages.